Modesto’s airport neighborhood will get $6.1 million worth of sidewalks and bicycle paths, welcome news to resident Norma Padilla. She walks her children and others to and from Orville Wright School on a three-block route that lacks sidewalks in some places. Cars can get dangerously close to students. Rain puts mud puddles in their way. The Stanislaus County Public Works Department will carry out the work between now and May 2022. The funding, announced this week, includes $4.9 million from the state’s new gas tax and $1.2 million from a sales tax enacted by county voters in 2016. Both pots of money will mainly pay for improvements for motor vehicles around the county and state. Smaller slices will go to rail and buses and to projects that encourage walking and biking. The airport neighborhood is one of Modesto’s poorest. It dates to the 1930s, when Dust Bowl migrants from the Great Plains built small homes out of mostly scavenged materials. They didn’t bother with sidewalks and such amid the Depression. Today, the place is home mostly to low-income Latino people. The southern half, within the Modesto city limit, got sidewalks over the years. The northern part, which the county government serves, has them in only some places. The project will take care of about half of the remaining sidewalk need, Public Works Director David Leamon said by phone Thursday. “We’re doing the high-traffic streets that the kids use to get to school,” he said. The two miles of new sidewalks will be built on parts of six streets: Tenaya, Kerr, Mono, Tioga, Santa Cruz and Empire. The main bike path will run about 4,500 feet in a rough diagonal from Mono Park in the northwest part of the district to the edge of Modesto Airport in the southeast. There, it will connect with existing trails in Tuolumne River Regional Park. Most of the new bike path will be entirely free of motor vehicles. The rest will have low barriers glued to the pavement to separate these vehicles from cyclists and walkers. Empire and part of Santa Cruz will be designated as bike routes where riders share the streets with cars and trucks. The project includes education, in English and Spanish, on how to ride safely here and in other parts of the district. 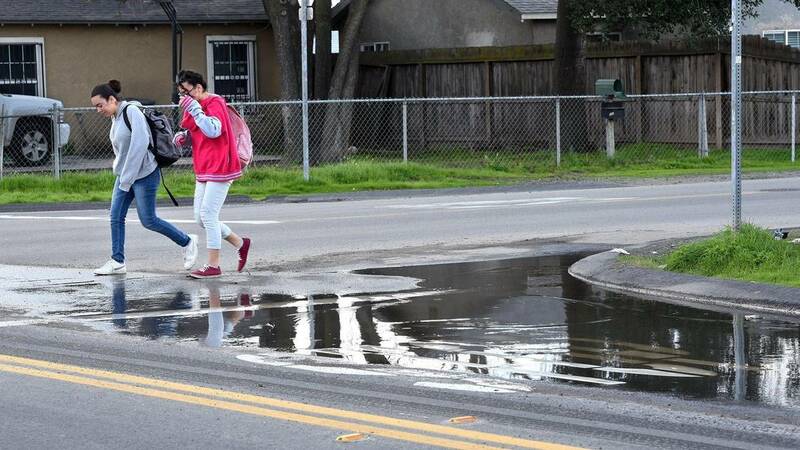 The county has worked on the project with the city of Modesto and nonprofits such as the Tuolumne River Trust and the Airport Neighborhood Collaborative. The application for the state money noted that 23 percent of airport district households don’t have access to a car. About a third of Orville Wright students walk to school now. The new sidewalks could boost that to close to half. Padilla talked about the project at the community center next to Orville Wright. She has five children at the elementary school, and she walks with as many as five others each day. Lourdes Ramirez, a neighbor of Padilla on Empire Avenue, also was at the community center to talk about the project. Ramirez said street puddles can get so large that they flood her home. The area will not get storm drains as part of the project, Leamon said, because the funding sources are for transportation. The new sidewalks nonetheless will be built in a way that reduces some of the puddling, he said. The county expects to complete detailed plans by August and acquire right of way by September 2020. Construction would start in late 2020 and take about a year and a half. Modesto Bee staff writer Rosalio Ahumada contributed to this report.